Tag Archives for " Brian Jensen "
Thursday is guest post day here at Duct Tape Marketing and today’s guest is Brian Jensen – Enjoy! In January 2012, it was announced by comScore that Pinterest was the fastest website ever to reach 10 million unique visitors. In August of the same year, Pinterest surpassed the microblogging platform Tumblr for unique monthly visitors and this upward growth trend doesn’t appear to be slowing down anytime soon. According to a Q3 Consumer Sharing Trends Report released by Share This, Pinterest is the fastest growing online content sharing platform. This explosive growth has made Pinterest a viable traffic and revenue source for many B2B and B2C businesses. For brands that utilize image sharing networks, migrating your existing social media followers to your Pinterest account and integrating the platform into your other social media networks is an integral part of a visual marketing strategy. Also known as community or shared boards, group boards are similar to regular Pinterest boards except that multiple users can contribute and add pins. It’s easy to spot group boards from personal boards by the gray people icon located in the top right corner of a board. Pinterest group boards are a great way to meet other users and increase the exposure and engagement of your pins. To find group boards that are relevant to your business or industry, try using Board Deck. The tool works by searching for and returning group boards that you can evaluate and potentially start incorporating into your pinning strategy. 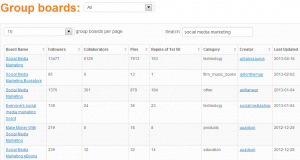 The above screenshot shows the group board results for the search “social media marketing.” The tool provides you with important metrics like group board followers, collaborators, total pins, number of repins, creator and last updated, to give you an idea of the popularity and activity on each board. Joining a group board is usually as simple as reaching out to the creator and letting them know you’d be interested in contributing to the board. If you are adding shareable images and graphics on your website or blog, making the images as easy to pin as possible will help get your images pinned, create links and increase the visibility of your brand and website. The first step is to make sure you have a Pinterest share button enabled and included with your other social sharing buttons on your website and blog. If you are using WordPress as your content management system, there’s a plugin you can install that will add a “Pin It” button anytime a reader hovers over your images, making sharing your images intuitive and easy. 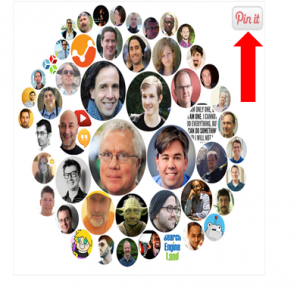 Pinterest arrived to the social network party after other popular networks like Facebook and Twitter. Because of this, many brands have established followings on one or both of these networks and a need was created to raise awareness for their Pinterest channel. Google+ is another social network that has seen impressive growth in 2013 and now claims over 300 million monthly active users making it an important social channel to establish a strong social footprint on. 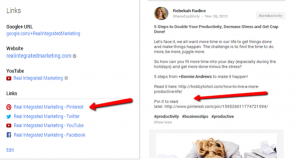 To add a link to your Pinterest account on your Google Plus business/brand page, navigate to the “About” section then to “Links” where you can add all of your active social networks accounts. 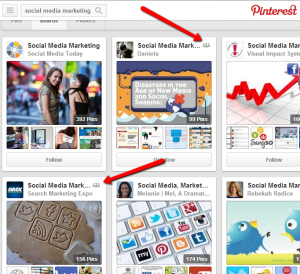 Encourage repins by including a “Pin it for later” link at the bottom of the Google+ posts you share. Facebook has created apps that allow users to integrate their other social networks (Twitter, YouTube, Flikr, Instgram, Vimeo, HTML 5) into their Facebook page through custom tabs. The Pinterest app provides followers with the option to like, pin, view and follow your boards and is a great way to integrate and increase awareness of your Pinterest account on Facebook. YouTube allows users the option to add links into the box in the bottom right hand corner of their channel art. Add a link to your Pinterest account by logging into your account, clicking the pencil icon in the top right hand corner of your channel art, clicking Edit Links and add your channel URL. Adding a link to your Pinterest channel will make it easy for your YouTube subscribers and viewers to find and follow you on the network. It’s also a smart idea to add a link and call to action for all of your social networks in the description section of your channel videos. Utilize your existing following on Twitter to build awareness to your Pinterest account by tweeting pins of images and graphics. Pinterest marketing is fun, and the traffic and visibility payoff can be big if you’re able to successfully attract, share, integrate and engage. What are your success stories? Is there a valuable tip you’d like to add? If so, leave a comment below! 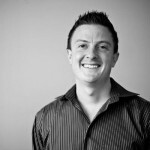 Brian Jensen is the Director of Traffic Acquisition at SEO.com and has a passion for all things marketing. If you have an online marketing question, connect with Brian on Google+, Twitter or LinkedIn.